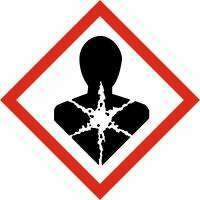 The hazard symbol for carcinogenic chemicals in the Globally Harmonized System. Image via Wikipedia. People and wildlife risk more harm from chemical mixtures than from separate exposure to the same chemicals, mounting scientific evidence shows. From plastic floors and food packaging to flame-retardant furniture, every day, we're exposed to complex mixes of hundreds or even thousands of chemicals. Regulators believe that if each chemical in the mix meets safety levels, the toxicity risk from chemical mixtures is negligible. But growing evidence now shows that this belief may be fantasy. Tests on mixtures of chemicals at concentrations within safety levels set by European water quality legislation showed effects on microalgae, water fleas, fish and frog embryos. "An increasing body of science shows a neglect of mixture effects can cause chemical risks to be underestimated," said Professor Andreas Kortenkamp, the leading toxicologist at Brunel University London. There is currently no protection against mixture risks produced jointly by chemicals from different regulatory sectors, such as pesticides, together with food contaminants, industrial chemicals and cosmetics. Prof Kortenkamp wants regulators worldwide to include mixtures in risk assessments. "Clearly mixture risk assessment is needed for better protection of humans and the environment," he said. In Europe, different chemical safety limits are set in different chemical regulations. Household, industrial cosmetics and food all have their own safety limits, which is where joined-up regulation to safeguard against risks from chemical cocktails hits a wall. This can only be fixed with several interlocking policies, says Prof Kortenkamp. "Without explicit legal mandates for considering mixture effects, nothing will move forward." The first step, he suggests, is to bring mixture risk assessment into all strands of regulations such as ones for food, soil, air, water and food. "This would bring regulation in line with the real world, where all kinds of chemicals arrive together in our bodies and the environment." However, working out proper protection against mixture risks will take time. As an intermediate step, the safety limits for all industrial chemicals could be lowered by a factor of 10, as suggested by some European Authorities, most recently from The Netherlands. This would help to reduce risks from combined exposures to multiple chemicals. Interesting that some of us ahve been warning about the toxicology of chemical stews being a big problem. As the chemicals are tested in isolation and then approved... but never texted in the complex stew that is the real world of all these chemicals combined. What it adds up to, in the real world... is a horrific level of toxicity. Humanity, and the world --- can't survive in this stew. The stew has to go. The problem is that corporations don't want to roll this back, they want the right to keep producing their little corner of the stew mix and to hell with the world. This is about the inherent psychopathic mentality of a corporation, damn it! And the psychopath must protect itself from community values as those values are against the forced psychopathy of the corporate mandate! Corporate life/existence and profit at any cost....that's how we managed to get to where we are today. Eg.. the build up and release of 5G wireless before impact studies.